I recently took on this job of adding clear coat to my car to give it a shiny finish. It was not an easy job because I had to make sure that I cleaned it out very well before applying the finish. Another challenge was finding the perfect finish that will make it look brand new and show a dull finish. What exactly is a clear coat? In order to choose the best clear coat for cars, it is important that you know what it is. Clear coats are exactly that, clear top coat to add a protective layer to your car. It creates additional shine and also protects against UV rays that makes your car paint fade. Clear coat is also known as 2-stage paint as it is added to the base color coat. Hopefully, by the end of this article, we have helped you decide on which clear coat is best for your car and removed any misgivings you may have had in applying clear coat. If you are looking to repaint your car and want to obtain the best clear coat, the following products should help you limit your search. I tested about 20 products in search of the best clear coat for cars and here are our other recommendations for you. It wasn’t an easy task but it was worth it. ​We tried and tested one of the products and we recommend that you choose Dupli-Color BCL0125 Clear Perfect Match Automotive Top Coat which is made of acrylic lacquer and does not emit a strong odor. It is easy to use and is compatible with any car color, giving it a smoother finish. The only problem with this product is that if you don’t properly prep up your car’s surface, it won’t stay long and you need to reapply the product. The second product is USC Spray Max 2k High Gloss Clearcoat Aerosol which is a 2-component aerosol clear coat spray. It is good to use on any base coat no matter the color of your car. Don’t forget to store it in a temperature of 68 degrees Fahrenheit and consume all the contents within 24 hours or it will go to waste. To avoid inhaling the polyethylene fumes you need to keep that protective face mask on even after application. 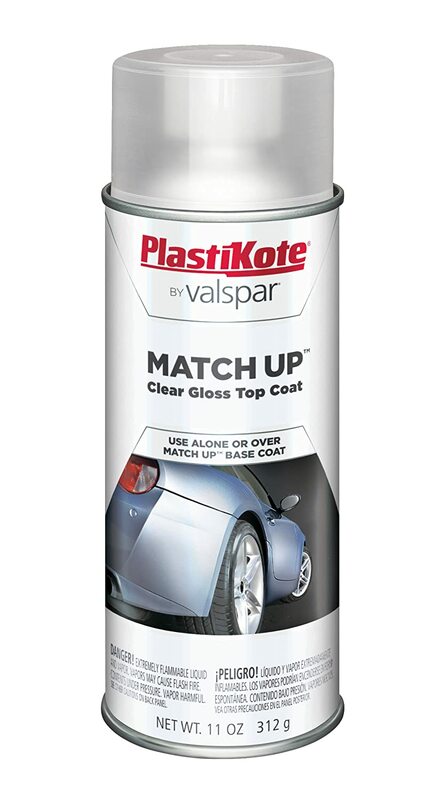 The third product chosen is PlastiKote 1000 Universal Clear Coat Automotive Touch-Up Paint. This universal clear coat dries fast and provides a tough, long-lasting finish that prevents scratches, rust, and tarnish. This paint is made of acrylic lacquer and does not emit a strong smell. The last is Dupli-Color BSP300 Clear Coat Paint Shop Finish System. This product is ready to spray lacquer requires no mixing. However, since it’s in a can, you have to transfer the contents to a spray bottle in order to use it. It is not like the usual paint where you have to mix it; just use it as it is. It also comes in different colors to match your car’s color if you want a brighter paint finish. I have been an auto mechanic for many years now and most of the articles that I write are based on experience or from friends who seek help. Repainting cars is one of the tasks that I normally take on since most of my clients who come in want to make their cars look brand new. I also consult my mechanic friends and learn different tips from them. Whenever I learn a new tip about cars, I test them with my own car and see the difference. ​I try on different products on testing surfaces. I go to other automobile shops and even junk shops and see if there are discarded parts such as doors or hoods which I can test the paint on. ​For this article, I checked out different products on Amazon and carefully read the reviews. After that, I purchased the products that were highly recommended and tried them out. I also asked help from my mechanic friends so they can test the products and we can come to a consensus. ​Anyone who is into cars will definitely want to repaint his own car at some point. It could be an overall paint job or just to hide some scratches and dents. ​The top benefit of applying clear coat to your car is that it helps protect your car’s paint from harmful elements such as acid rain, dirt, bird droppings, pollen, and even water spots. It also helps protect against the harmful UV rays of the sun that causes your paint to fade and dull. ​Another good thing about clear coat is that even if you have an older car, you won’t have to search for a top coat that matches the base color. Your old vehicle can still look good as new by applying top coat on it. ​If your car has some scratches, a top coat can also hide these as it fills in the gaps on scratches. Your vehicle will come out with a smoother and glossier finish after applying clear coat. ​Should you have plans to sell your car, then applying clear coat will ensure that your car still looks brand new. First impressions last, so the first thing that buyers see is the external of your car. Therefore, keep it looking brand new. ​After applying clear coat on your car, do not neglect to do the regular cleaning such as claying, waxing and polishing. Clear coat only adds a protective layer but you should still keep it well-maintained to get the best finish. The gloss level should be higher than 90 units. This ensures that the finish will come out shiny as new. You don’t want to dull your car’s original color so transparency is a big factor. Therefore, the clear coat should be clear as water. The nozzle should allow you to easily apply the product. It should have no drips and spray evenly on the surface. Otherwise, the finish will come out in clumps and some surfaces will dry slower than the rest. The clear coat should have UV protection as well as scratch resistance. The reason why you’re applying clear coat is because you want your car to be protected from elements. Another layer of protection should do its job in providing maximum protection for your car. High price does not necessarily mean high quality. Look at the volume of the product. If you think it is too much for your car and has a short shelf life, then it is not worth it. Choose a product that is reasonable enough, look at the description rather than the price. The above factors should help you limit your search. This is the final coat or the finishing touch to the base coat. An effective topcoat should be easy to apply and easy to polish. Turbo clear coats dry faster but need more polishing to get that glossy effect that you need. Glamour clear coat dries slower but the benefit is that it is less sensitive to moisture. This type of clear coat contains more additives resulting to a thicker film. Since it’s thicker, it also dries slower and are more expensive. This type of clear coat needs heat in order for it to dry quickly. The name does not suggest that it is of higher quality. Choosing the best clear coat for cars is not an easy task. With careful research, we also need to test out the products that we chose to provide you a guarantee. ​Before we go into detail, keep in mind that pre-application preparations are also important to get the best out of any clear coat product. There is such a thing as clear coat failure wherein the clear coat comes out in clumps or uneven coats. Your car may look like it just came out of the wash and hasn’t been rinsed off properly. To prevent this from happening, you should clean your car very well before applying the clear coat. Think of it this way, whatever is on your vehicle’s surface will get trapped as soon as you apply the clear coat. So, if a spider accidentally falls on your hood then it’s there for good. ​What we did was to get 4 different samples. We got discarded hoods from an automotive repair shop - those that are still in good condition. We shampooed them and used a clay bar to remove any water spots and residue. After that we painted over them. We used 4 different base coat colors for each hood- black, white, red, and blue. These will represent 4 different cars. Using different base coats allow us to see the differences that each clear coat would show. ​Another reason why we chose to repaint the hoods is because we never know if the samples have been repainted and have clear coat on them. To eliminate that concern, we simply repainted them so we can be sure that it only has our experimental clear coat products. ​The next step was to mark the sections off. We placed masking tape to divide the hood into four sections and labelled them with the names of each product. Therefore, each product will be tested on all colors. ​Why the hood and not the doors? The hood is subjected to heat due to the engine and the sun. This will allow us to test the product against heat and other elements. ​After applying all clear coat products on the samples, we let them dry for a day. We recorded the actual times that we applied the clear coat and took note of the time that they fully dried up. We also took note of the smell and how easy or difficult it was to apply the clear coat products. Now here comes the fun part. ​We sprayed all doors with rain water. We were lucky enough to get rain the day before so we decided to save some in a barrel for our test. After subjecting them to the rainwater test, we wiped them off and looked at the results. ​Next, we applied heat under the hood and checked if the clear coat would “melt away” or show some changes. We also left the hood out under the hot sun and checked the results. ​The last step was to sprinkle soil over them, drenched them with water then let them dry out in the sun. This mimics dried mud and dust. We couldn’t get some birds to poop on them so we scratched that test off the list. ​After the dirt has dried, we wiped them off with cloth, recorded the results then proceeded to subject them to a car wash. We also got out our clay bar to remove elements that may have been left behind. We proceeded to waxing the car hoods and polishing it to a glossy finish. We checked all surfaces again. ​After subjecting all samples to the tests, we compared our results and determined which clear coat was the best. There were some ties and disagreements over a product, but overall we came down to just one choice. Based on our tests, we have one clear winner because the sections where we applied the clear coat still showed a smooth and glossy finish despite the experiments. And since the sections were side-by-side, it was easier to compare the surfaces. One of the products caused a dull color on the hood when subjected to the heat test. Another product showed clumps after a day. ​The winner of this round is Dupli-Color BCL0125 as the best clear coat for cars. This product was chosen because it was fast drying, looked great on any color, and did not have a powerful smell. Since it is made of acrylic lacquer, the smell is not as overpowering as polyethylene. The adjustable spray nozzle makes it very easy to spray on and projects a smooth and clear finish. It also provides additional gloss and protection so the original paint does not look dull. It matches perfectly with your car’s color that you can use it for touch-ups and finishing touches. ​Another reason that we chose this is because it was the easiest to polish. It was easier to remove the grime and there was not to much to do with the clay bar. We also noticed that since it was the smoothest, the wax easily glided over and we just had to polish it with a microfiber cloth and it was shiny as new. This is also the only product wherein we did not apply a second coat. It dried up quickly which prevented dust from sticking to it. 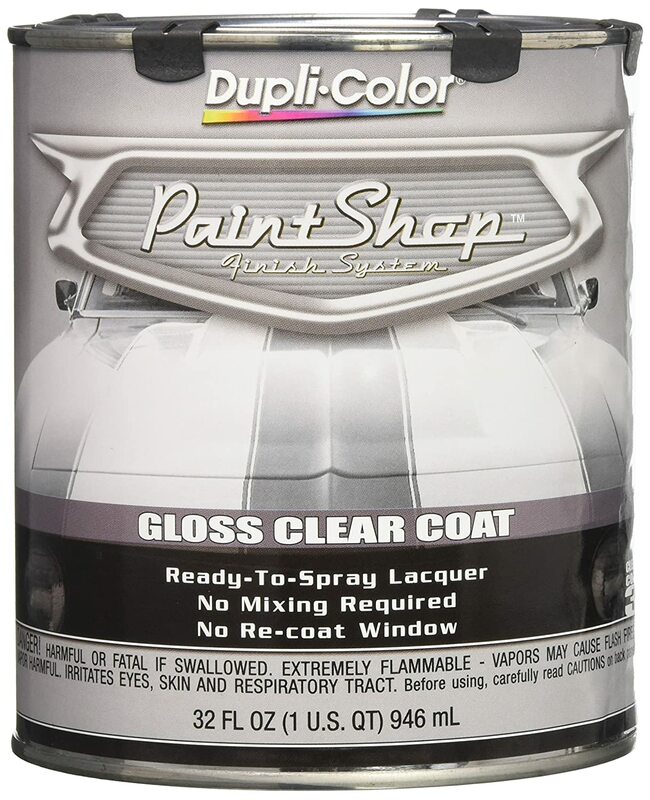 ​At a reasonable price, Dupli-Color gives your car an overall glossy finish without the clumps of paint. It also dries up easily so you don’t have to worry about elements sticking to it after application. And since it is made from acrylic lacquer, there will be no toxic fumes to worry about; although you still have to wear a protective face mask to avoid inhaling the chemicals. ​Now that we have explored the different clear coats in the market and discussed the pros and cons, it’s up to you to choose the best clear coat that suits your needs. Remember that pre-application and the actual application may affect the results afterwards. ​It all comes down to three factors: transparency, gloss, and easy application. It is now up to you to make your choice but we hope that we have enlightened you in the process. ​If you have tested any of the products and would like to give feedback, please let us know. We would also love to hear your experiences with regard to repainting your cars. ​Should you have further questions, comments and suggestions for us feel free to leave a comment or message us. We would love to hear your creative ideas as well. Please don’t forget to share this article with your friends!